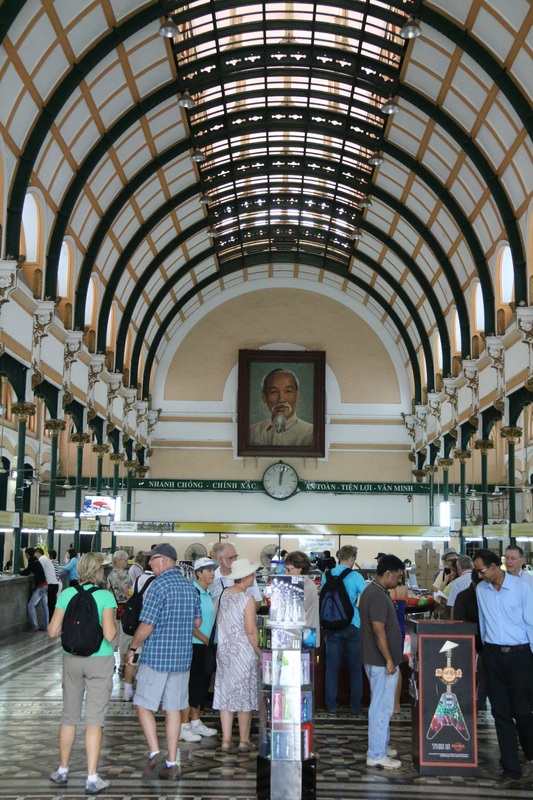 The South East Asia path that I am following commences in the thriving bustling city of Saigon. Now, before I get bombarded with messages saying It is not Saigon, it’s Ho Chi Minh City, I can advise this little nugget. The name was indeed changed in 1976, the year after the communist funded North Vietnamese were victorious over the American backed South. However, such was and still is the use of the old name of Saigon by the local populace, that the term is used widely and officially acknowledge as such today. It’s also easier to type! 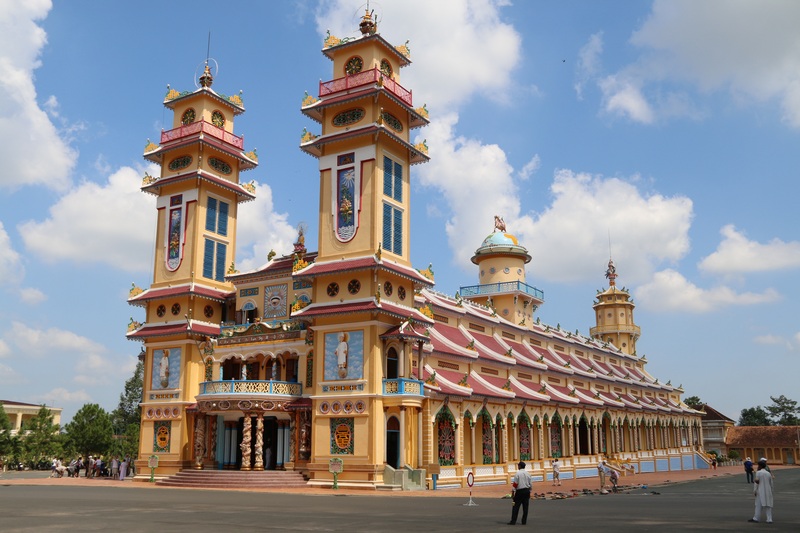 Saigon was the capital of the old french colony of Cochinchina and then the Republic of South Vietnam; and is the largest city in modern Vietnam. 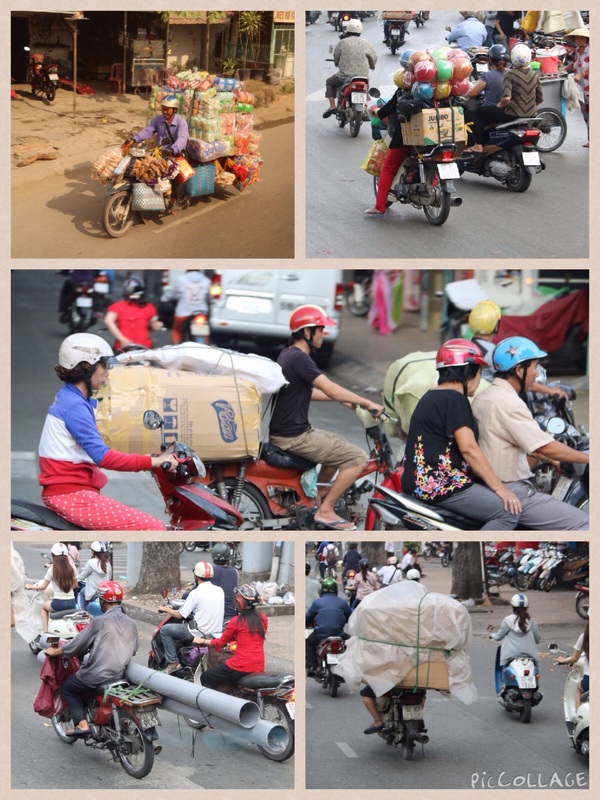 Officially the population is nine million people, but it is purported to be more like ten million: and nearly everyone has access to a motorcycle or scooter! Almost 24/7 the streets reverberate with the sound of scooter horns, and with this level of traffic it is no wonder why many wear face masks to avoid excessive inhalation of fumes. Scooters are not just people carriers, indeed multiple people carries; but also delivery vehicles. They weave in between traffic in a haphazard yet controlled manner. At traffic lights, the green signal is like witnessing the start of a MotoGP race, though ever so slightly slower and with far less restraint. Fortune smiles on the brave…or just plain foolhardy! Saigon owes much of it’s fame to 1975 and the twenty years leading up to it. The former South Vietnamese presidential palace is now a place for remembrance, renamed the Reunification Palace. A 1960s building replaced the more ornate and visually pleasing french influenced building of yesteryear. The rooms are as they were left in 1975; the Cabinet Room decisions where made, the presidential apartments, the underground command centre. Outside stand two tanks; one Russian built, the other Chinese. These were the battering rams that fought their way into the compound. Atop the building rests the presidential helicopter. Homage to the war that befell this country is also paid at the officially entitled War Remnants Museum. It is fair to say that propaganda is present; and victors write the history books as the old adage goes. There is no testament on display to the South Vietnamese or American perspective. it is however undeniable that atrocities took place on both sides. But what was this war: the Vietnam War? Vietnamese call it the American War, the War between North and South, and so forth. The roof top seen in many a photograph from which the Americans airlifted fleeing citizens out by helicopter in 1975 is now an anonymous attraction but nothing more. As mentioned before, Saigon was the capital of a former French colony. And as such it is bejewelled with some fine classical architecture. The aptly named though considerably smaller Notre Dame Basilica is one such building; though opposite this is the much more authentic Gustave Eiffel designed General Post Office. With is large arched interior it is a genuine treasure. The war theme continuos throughout Vietnam. Just over an hours drive outside Saigon are the Cu Chi tunnels, a 250mile network that housed accommodation, hospital and ammunition for the Vietcong fighters. Ingeniously hidden and booby-trapped, the tunnels covered three levels and were contained in a way that should the opposing forces gain access via military personnel, dogs, or gas; each section could be closed off. The claustrophobic nature of the tunnels was such that now larger tunnels have been excavated to entice western tourists. 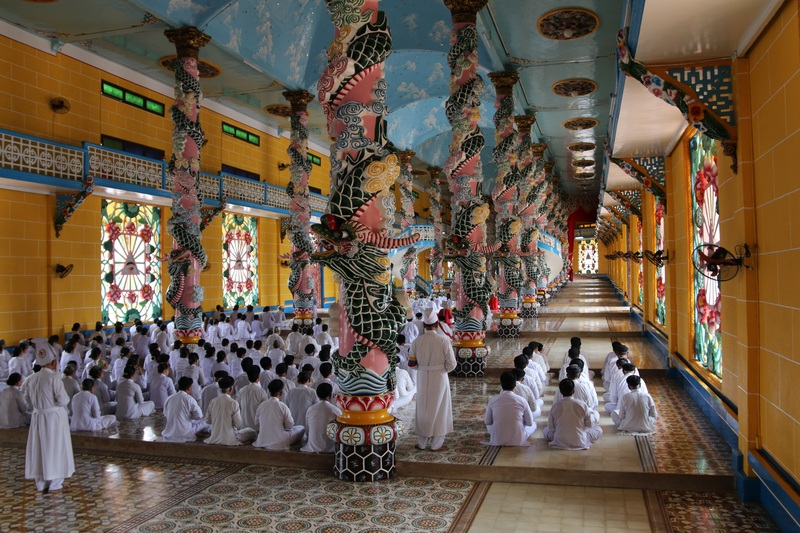 Religion plays a great part in Vietnamese life, and not far from Cu Chi is the highly coloured and decorative Great Divine Temple of the Cao Dai Holy See whose formation goes back to 1926. The temple, built in 1933, combines Asian and European design elements, and daily services are well attended by hundreds of clergy. 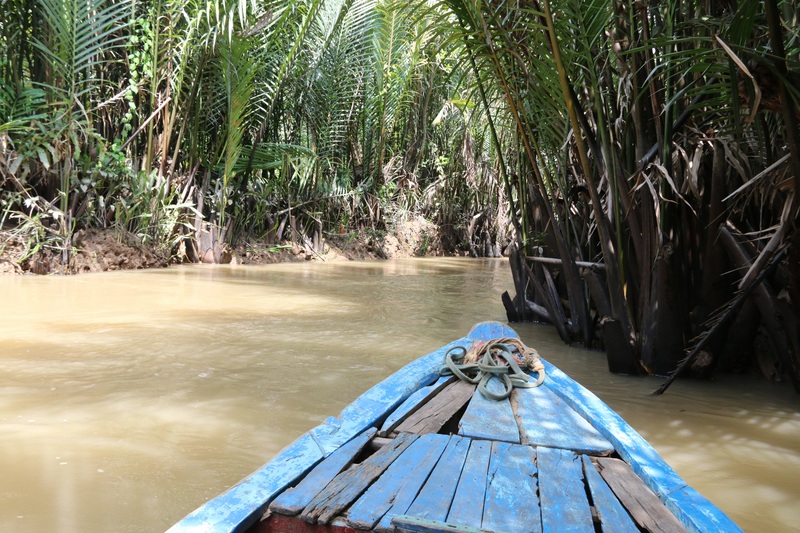 The mighty Mekong Delta is the other great sight in southern Vietnam. Formed from the Mekong River whose beginnings are in Tibet; the silt coloured waters have already travelled 2,800 miles through China, Myanmar, Thailand, Laos and Cambodia. Splitting in to many tributaries, they form what is referred to as the ‘rice basket’, irrigating vast areas ripe for harvesting. The river borne houses built on stilts accommodate communities who fish the river; and the waterway provides an ever present ‘highway’ for people and goods.